Catering specifically for men, Redken Brews Shampoo, Conditioner and Body Wash cleanses, hydrates and revitalises the hair and skin. Infused with nourishing Malt, the lightweight formula works as a 3-in-1 product that is perfect for use at home or on-the-move. Deeply nourishing and strengthening, you will be left feeling refreshed and rejuvenated from head to toe. Smelled great. Left my hair feeling good and skin smelling great too. This product is fantastic! Does exactly what it says and the smell is great. Truly masculine and "clean"; it smells almost like a fine cologne. Hair feels clean and soft after use. A great all in one solution and ideal for the gym bag! Pleasant unobtrusive scent of spices. This is the shampoo I was looking for because of the fact that he does not give hair volume as the Most of Her shampoos that used previously. Pleasant smell of spices, the hair after shampooing long stay clean. I will buy it again and also recommend to your friends. 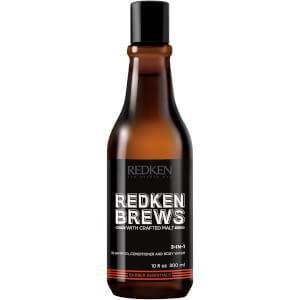 This is a really good shampoo by Redken. Washing is very pleasing. Cleanses thoroughly while caring at the same time. No feeling of dryness, no "heavy" hair though the 2nd component is a conditioner. With a delicately perfumed scent. I would buy this again.